A rack that will have you yelling, yabba dabba do! 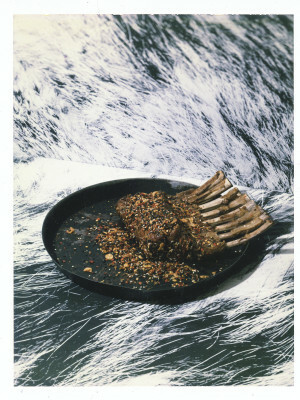 Our primeval lamb rack is mammoth in both size and flavor—swaddled in a parade of spices (cumin, chilies, and sesame, both black and white) that derive their influences from China’s Dong Bei region near Mongolia, it will inspire a dinosaur-like appetite. Preheat oven to 325°F. Season lamb rack with salt. Heat 2 Tbsp oil over medium-high heat in a heavy bottomed skillet large enough to fit the rack. Brown rack until deep golden brown, then set aside. Discard all but 1 Tbsp fat from pan and reduce heat to medium. Add onion, garlic, and ginger and cook until softened, 3 to 5 minutes. Stir in wine and return rack to skillet fat side down. Add cumin, anise, and enough water to just cover three quarters of the way up the lamb. Bring to a simmer, then cover and transfer to the oven. Bake until lamb is tender, about 1½ to 2 hours. (Lamb can be made up to two days ahead, covered and refrigerated. Reheat in braising liquid until hot throughout, 15 to 20 minutes). Meanwhile, make spice rub. Coarsely grind chilies in a food processor or mortar and pestle, then stir together with remaining rub ingredients, along with ½ tsp salt and set aside. When lamb is tender, discard liquid and cool slightly. Whisk together cornstarch with water and brush onto top and sides. Coat with spices, saving any that won’t stick. Wipe skillet clean and heat remaining 1 Tbsp oil. Sear lamb 20 seconds on each side and transfer to a serving platter. Add remaining spices to skillet and cook until fragrant and toasted, 15 to 20 seconds. Spoon over and around rack. Slice into chops to serve.